The WebSphere Voice Server product is a member of the IBM WebSphere software family. It provides a platform that enables the creation of voice applications through industry standards such as VoiceXML and Java. The WebSphere Voice Server facilitates the deployment of voice applications by interfacing with voice standards such as Cisco VoIP, IBM DirectTalk, and Dialogic platforms. It further aids the development of these applications by providing development tools. 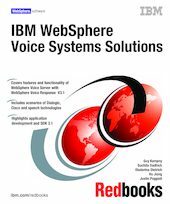 This IBM Redbooks publication discusses the functionality of WebSphere Voice Server in the context of real business environments. We introduce the voice environment and the WebSphere Voice Server. We cover in great detail the various operating platforms supported by WebSphere Voice Server (Dialogic, Cisco, and DirectTalk - also referred to as WebSphere Voice Response). The product has been further enhanced to function on both Intel and AIX systems. The book goes into some depth about this new functionality. Additionally, we discuss both the Software Developers Kit (SDK) and the Voice Toolkit that are available for the development of voice applications. A step-by-step approach was taken to walk through the development of a VoiceXML application utilizing both of these tools, and taking advantage of the new functions provided within them.